Let’s face it. Apple pie is really a French invention. Hate to break it to you, but so are Freedom Fries. When I crave something sweet and authentically American, the first thing that comes to mind is a good old fashioned chocolate chip cookie. Preferably dipped in milk. The chocolate chip cookie and the American Revolution both have their roots in the Boston area, and I can’t help but think that Paul Revere would also have ridden all night to taste the warm, gooey goodness we all know and love. “The Nestle’s are coming, the Nestle’s are coming!” So, raise your milk glass with me in a salute a great American classic, and check out the below recipe. 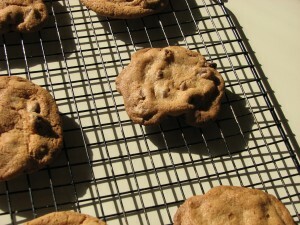 Drop dough by tablespoons full (I like big cookies. If you prefer smaller cookies, use a teaspoon) onto cookie sheets (no need to grease), keeping cookies about 3 inches apart. Bake in batches, rotating once to ensure even cooking, about 10 minutes or until evenly browned. Remove from oven, allow to rest 1 minute, and transfer to cooling racks. Makes about 2 dozen large cookies.